March 31st, 2009 | Images, Misc. A recent EarthBound community project was to create a really tall “Saturn ladder”. It’s hard to explain, but basically people drew a Mr. Saturn and then they were later all compiled into a really huge art piece, which you can see here. It’s pretty cool, so check it out sometime! 36 Comments to The Ultimate Saturn Ladder! 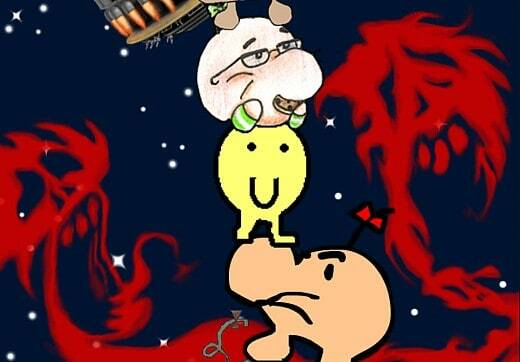 Good Lord, in this part of the great picture, my Mr. Saturn is in it! Yay! I like the Mr. Saturn on the very bottom. Poor thing. That’s such a cool pic. I wish I could save the whole thing! Wow it turned out really really cool. I agree with James when I parrot that I also regret not contributing. Ahh! So many Mr. Saturns! I see mine! That makes me happy. Congrats to everybody who contributed – it’s awesome. Such an impressive project. 😉 I like how you can get the name of the individual artists if you hover the mouse over the Mr.Saturns. A nice touch, methinks! Who did the background, anyway? I don’t think that was mentioned. Was that also done by different artists? I wish I knew this was going on! I would’ve loved to draw a mr. saturn for this. Artemis251 created the Background and put together the ladder. Anyway, really impressive work for Artemis. I love his painting of Leder. Wow, awesome project! Never heard about it before know though, wish I had, but anyways, cool saturns there! The Saturn I drew is there, but no fart waft propelling it into the air. I’m surprised fans of Earthbound are so humorless, lol. That is abso-friggin-lutely amazing! It took 15 minutes to load, but it was totally worth it! I was just thinking, “I hope the bottom one doesn’t fart” before I read this. But..but…ONLY FIVE CAN LADDER!!! Ah well it’s impressive no doubt. Waaaaaiiiiit a second what is this tomfoolery!? Oh geez. That’s craziness…one of those I MUST HAVE artworks, so I went from top to bottom of the page and assembled one huge pic from screencaps. It spans over 22,000 pixels high — that’s quite the monument to Mr. Saturn! The picture links to earthboundcentral.net. Holy cow! That’s an impressive picture! Man, the Saturn Ladder was awesome. The wait was totally worth it. I’m glad I contributed to it. That think is SO tall! The background is really good too. There should be another one of these so those who didn’t get to participate last time can. I did the second one from the top. Kind of a spoiler-ey pic for people who have not seen Giygas. It’s a cool project. The moral of it is: Don’t believe rumors. FaR mOrE tHaN 5 cAn LaDdEr. It probaly took a very long time to get all those saturns, from drawings to 3D objects of them. That ladder just has them all.